Cardiac MR viability studies normally consist of wall motion imaging pre gadolinium injection and delayed enhancement imaging post gadolinium injection. In myocardial delayed enhancement imaging, it is essential to optimize the inversion time (TI) in order to null myocardial signal and better visualize scar tissue. This can be time consuming during an MR exam when contrast is quickly dissipating. ECG gating is necessary and almost all cardiac MR pulse sequences require the patient to hold their breath in order to obtain motion free images. With all of the pre and post contrast breath holds, the exam time is long and patients get tired by the time the delayed enhancement imaging occurs. The purpose of this paper is to explain a new cardiac MR pulse sequence that yields both wall motion and viability information, IR-SSFP . This sequence will decrease the amount of breath holds during an MR exam, reducing the total exam time and making it easier for the patient to complete the exam. The IR-SSFP sequence utilizes the R wave of the ECG signal as its trigger. The position of the inversion pulse relative to the R wave trigger is prescribed such that the inversion pulse occurs at the start of diastole. The 180° inversion pulse is followed by SSFP readout pulses (45° flip angle, 2.7 ms apart) that are repeated until the next inversion degree pulse (Fig. 1). Twenty cardiac phases are captured for each slice, each at a different inversion time and cardiac phase. The sequence takes approximately 12 heart beats to acquire a full k-space data set for all 20 images of a single slice. The first ten SSFP readout pulses after the 180° inversion pulse are not used in data acquisition (dummy pulses) because the SSFP pulses cause large oscillations in the signal immediately after the 180° inversion pulse. This sequence was used for cardiac studies on a 1.5 T GE scanner with an 8 channel cardiac phased array coil. A short axis stack through the heart (8–10 slices) was acquired using the IR-SSFP sequence post gadolinium. Diagram showing the R wave relationship with the SSFP pulses and the resultant images; note the diastolic viability information and the systolic wall motion information. Twenty cardiac phases are acquired for a single slice, each at a different TI, and all in one breath-hold. Following the use of gadolinium, the T1 recovery of infarct and healthy myocardium will be different (Fig 1). The first six or seven images after the inversion pulse will show delayed enhancement information and are acquired during the diastolic period of the cardiac cycle. As the pulses progress through the R-R interval, the later images will be taken during systole, and the tissue will exhibit a more standard SSFP weighting and thus can be used to visualize wall motion of the heart. IR-SSFP is useful in minimizing the number of sequences required during a contrast enhanced cardiac study since it results in simultaneous acquisition of both delayed enhancement and wall motion images. There is no need to acquire test images to try to optimize TI time for delayed enhancement because images at multiple TIs are acquired. 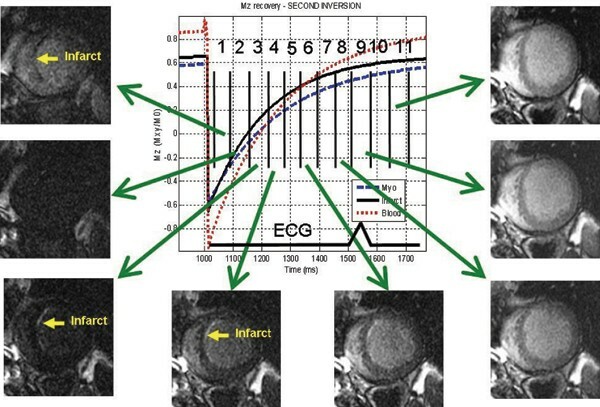 This sequence has been shown to be more sensitive for detecting small subendocardial infarcts than the standard FGRE delayed enhancement sequence because of the multiple delayed enhancement images with varying T1 contrast. It is also better at differentiating infarct from blood pool for the same reason. If diastolic wall motion is required, an additional sequence needs to be done since the myocardium itself is not well depicted with this sequence during diastole.